The first edition of this book received enthusiastic reception in the industrial communities world wide. Through its careful treatment and broad coverage, it has elevated alarm management to a place of importance for control room operational safety. This book elevates alarm management from a fragmented collection of procedures, metrics, experiences, and trial-and-error, to the level of a technology discipline. 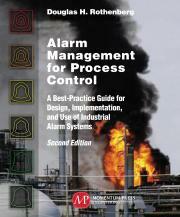 It provides a complete treatment of best practices in alarm management. The technology and approaches found here provide the opportunity to completely understand the what, the why, and the how of successful alarm systems. • Recommendations and guidelines are developed from fundamental concepts to provide powerful technical tools and workable approaches. • Alarms are treated as indicators of abnormal situations, not simply sensor readings that might be out of position. The ability to appreciate technical issues is important, but this book requires no previous specific technical, educational, or experiential background. The style and content are very accessible to a broad industrial audience from board operator to plant manager. All critical tasks are explained with work flow processes, examples, and insight into what it all means. Alternatives are offered everywhere to enable users to tailor-make solutions to their particular sites. Read the entire Second Edition Preface by clicking here. Doug Rothenberg is founder and President of D-RoTH, Inc., a leading world-class consulting firm in all areas of alarm management systems for industrial manufacturing and technology providers, based in Shaker Heights, Ohio. He holds a BSEE in Electrical Engineering from Virginia Tech, a MSEE from Case Institute of Technology, and a Ph.D. in Systems Engineering from Case Western Reserve University.